How about two recipes in one? Little one really enjoys mince and pasta based dinners. Don’t get me wrong I love spaghetti bolognese however sometimes it can get a bit repetitive. 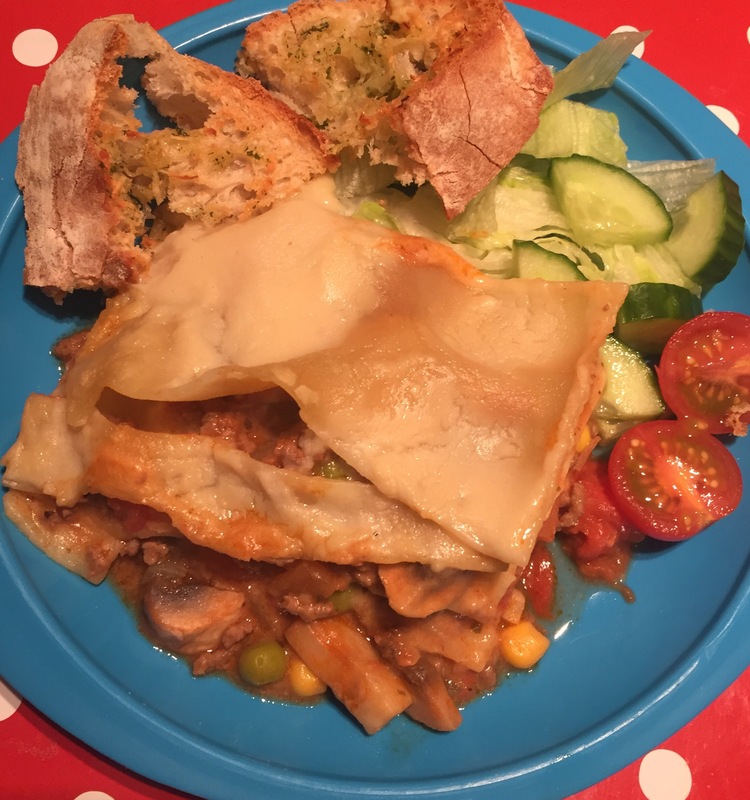 Lasagne and cannelloni is a twist on a familiar dinner which usually means a hit with little one. Add to that the addition of a white sauce which boosts her calcium intake, it means it’s a winner for me too! 2. Next add the onion, garlic, celery and carrot and cook until starting to soften, about 8-10 minutes. Add the mushrooms and return the mince to the pan, cooking for a couple of minutes. 4. Pour in the tinned tomatoes, veg stock (or just boiled water), cherry tomatoes and stir until well combined. Add seasoning if using. 5. Bring to the boil, then reduce the heat and simmer for 25-30 mins until reduced and the sauce is thicker. If it gets too thick then add a splash more water. At about ten minutes before finishing the sauce, add the frozen peas and sweetcorn and stir through. Whilst the meat sauce cooks you can make your white sauce. 2. In an oven proof dish place half of the meat sauce on the bottom and spread out evenly. Then cover with a layer of lasagne sheets (I parboil the sheets for 5 minutes first). Top with a third of the white sauce. 5. Pop in the oven and cook for half an hour until the lasagne is bubbling! If the lasagne looks as if it’s drying out cover with tin foil. This helps to keep in the moisture.Allow the lasagne to rest for 10-15 minutes before cutting and serving as it helps to hold its shape. 1. Preheat your oven to gas mark 6, 200 C. 2. 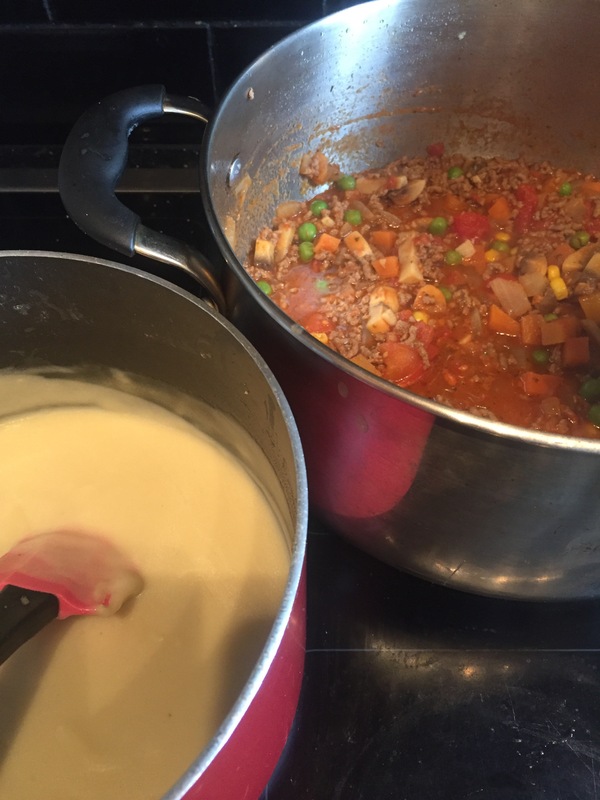 In an oven proof dish place a couple of tablespoons of the meat sauce on the bottom and spread out evenly. 3. Fill the dried cannelloni tubes with some of the meat sauce. Tip: stand the tube on a spoon and spoon in the filling. This stops the sauce from going straight through. Then place the filled tube on top of the layer of meat sauce. 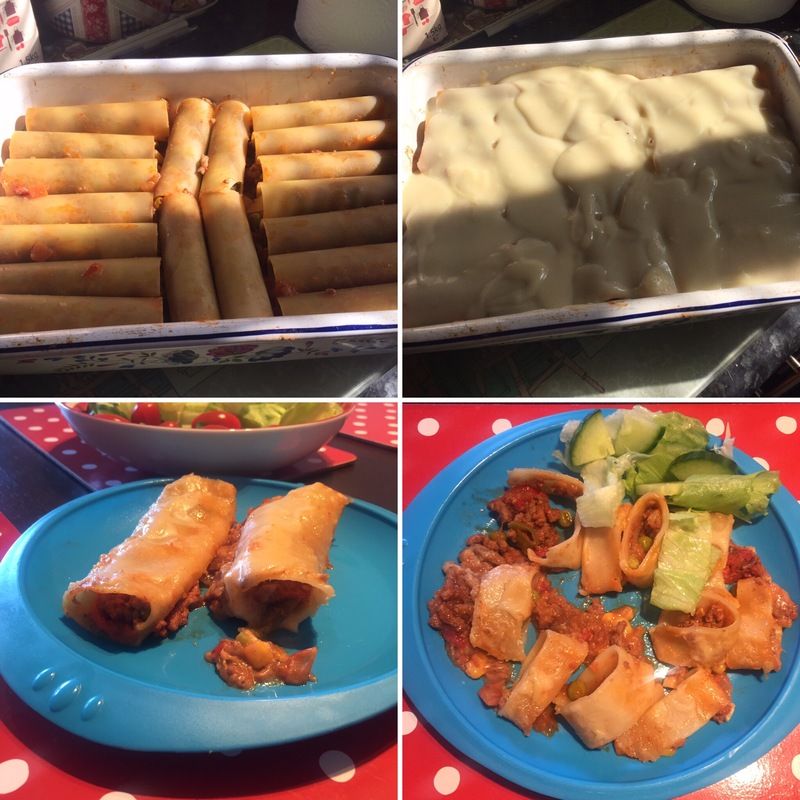 Repeat until you have filled your oven proof dish with tubes/ run out of cannelloni tubes or sauce (whatever happens first!). 5. Pop in the oven and cook for half an hour until the cannelloni is bubbling! If the cannelloni looks as if it’s drying out cover with tin foil. This helps to keep in the moisture. Allow the cannelloni to rest for 10-15 minutes before cutting and serving as it helps to hold its shape. Dairy, egg, nut and soya free. Use gluten free pasta sheets and flour to make gluten free.